This novel is about girl power. In the battle of the sexes, girls win. Provocateur explores that aspect of the human experience that surrounds the age-old contest between men and women. It is the story of Nadia, a young Russian woman who comes to America through a mail-order-bride program. She becomes employed in an enterprise operated by an ex-CIA agent named Olga, whose agency, through clever missions, extracts large amounts of money from wealthy men. In her assignments Nadia must get the best of alpha males that are at the top of the male order. Nadia, born an orphan, rises out of a life of poverty and despair,where she had no experience with affection, to face her struggles and take on the challenges of her profession. She is a complex, enigmatic woman of superior intelligence who must win through her finesse and feminine prowess. Provocateur follows a young Russian woman as she rises from poverty to a rich life filled with excitement and adventure. 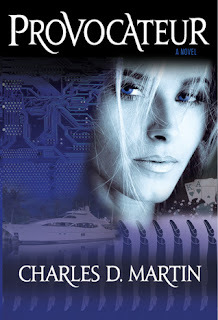 Charles D. Martin introduces, Nadia, a strong woman with a lot to learn about life, love, and the battle of sexes. When Nadia becomes employed under Olga, a former CIA agent, her intelligence and feminine wiles are put to use. Though as an agent her skills are not used for the greater good of the world, but rather used to con rich and affluent men out of large sums of money, Nadia's assignments are still entertaining and the perfect backdrop to showcase the power women are able to achieve over men. Martin's writing style vividly takes readers around the world while extensively detailing Nadia's missions. Amazingly, Provocateur stays focused through scenes that drag with excessive background information. The story being written in third person perspective allows insight into the minds of the men Nadia is assigned to seduce. Their reactions range from suspicious to awed at Nadia's expertise and prowess. It will be hard to not become intrigued with Nadia and her life that drastically changes from solemn to hopeful. 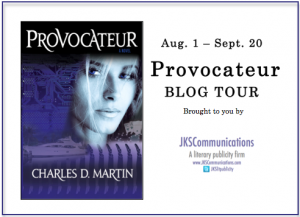 Provocateur proves to be a universal novel with appeal for any reader!